Why it is that, when you blow dry your hair at home it does not look as composed and in order as it looks when you leave the salon after getting a professional blow dry? Are the salons doing some magic while blow drying your hair or you can do it yourself at home? Actually you can do it yourself sitting at a cozy corner of your home, provided you know the right way to blow dry your hair. Most of the women blow-dry their hair in the wrong way. Although this is not a rocket science, but still there are some critical factors at play, which you should be aware of. Some women over-dry their hair or some use the wrong brush or some although use the right brush, but hold it incorrectly. 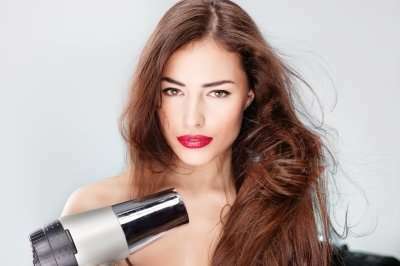 (iii) The best blow dryer which you can buy to blow dry and style your hair. (1) Brush Type: The foremost mistake is using metal brushes while blow drying your hair. The metal types heat up quickly, making them too hot to touch hair with. Choose a round brush with a mix of boar bristles and high graded heat protective nylon. (2) Heat and Air Settings: Do not use your blow dryer at high heat and high air settings, otherwise chances are you will over-dry your hair causing it harder to work with and difficult in getting the desired shape and movement that you would like to achieve. (3) Holding Blow Dryer too close: Do not hold the hair dryer too close to your head / hair. It should be held always at least six inches away from your head / hair. (4) Holding the Blow Dryer at one place: Don’t keep pointing the dryer at one place. Keep moving your blow dryer around the head / hair. Keeping the dryer pointing at one place, even for a while will over-dry and may fry your hair off. (5) The Angle at which you hold dryer and brush: A natural beauty tip for you is to hold your blow dryer horizontal and your brush vertical. Holding you brush vertical and blow dryer horizontal will get you more modern waves. Some women commit a mistake by doing it other way round, i.e., they hold blow dryer vertical and brush horizontal. (7) Also do not blow forward. The right way is to blow backward. (6) Separating Hair into sections: You may be sectioning off your hair. But you need to do it correctly. Try to have 4-6 sections and take the help of hair clips or ponytail holders, if you have thick or longer hair. The larger the sections, the more time it will take to dry. Also ensure not to have any tangled hair. If you have short hair, you may go for two sections. (1) Wash Hair: In order to have a better blow drying effects, either use a moisturizing shampoo or if you like using your regular shampoo you may do so but then condition your hair in the shower. Condition only at the ends, if you have fine hair. This way you will be having extra moisture on your hair that will protect your hair from the hot hair. (2) Blot Hair – Never Rub: Rubbing with towel is strictly no – no. The friction produces split ends, frizzy dryness and causes damage to your hair. Wrap the towel around your hair and gently squeeze. If your hair is too short to apply this technique, wrap the towel around your head and rub very gently with circular motions. Do not attempt to apply hair dryer on super wet hair. Just get rid of excess moisture. (3) Separate your hair into sections: Divide your combed hair into sections and hold them in secured positions with the help of hair clips or ponytail holders. Alternatively, you can wind hair into mini buns, two at the back and one at each side. In case of very thick or heavy hair, try dividing further each of your sections – one above the other. (4) Blow Dry at the top / roots, about six inches away from your head / hair: Keep this distance constantly from your head / hair. Avoid blowing dry in an upwards motion, since this leads to more damage. Blow dry in a downwards motion. Also by drying your hair from your scalp, it checks the moisture from wetting the rest of hair. (5) Work your way down, and keep moving the dryer constantly: If you keep pointing the dryer in the same position even for a while, it will burn and damage your hair. Keep the dryer settings at low heat and at low air blowing. (6) Leave your hair slightly moist: Do not try to completely dry out your whole head. A complete drying out of your hair will make it frizzy and damage it as well. Leave your hair a little damp so that it will dry naturally in about 5-10 minutes. (7) Finishing Touch – A blast of cool air, to lock in shine: If needed, de-tangle your hair with fingers and brush through your hair gently. If desired, you may apply a little moisture or anti-frizz serum or even a bit of olive oil and brush it through uniformly. This will give a shiny and smooth look to your hair instead of dry hair. (i) Never attempt to blow dry your hair, while it is dripping wet. Blot away extra moisture with a towel, before using hair dryer. (ii) Ensure to blow dry in one direction, moving downwards. This way you will prevent split ends and frizzy hair. (iii) Never put the dryer too close to your head and hair, not to even the hair ends. (iv) Try to use hair dryer at cool setting to protect your hair from getting damaged. Useful Related Article: How to wash your hair.